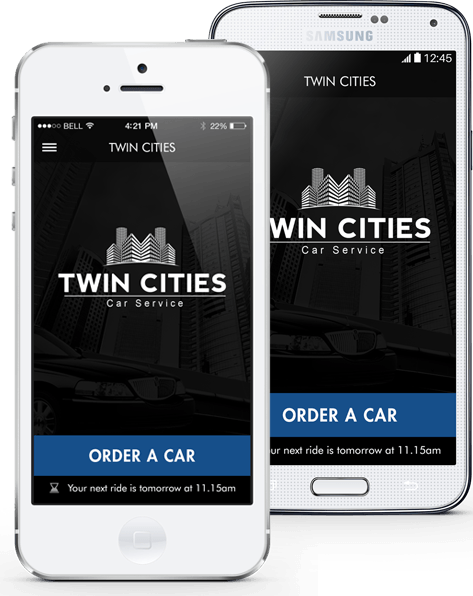 Twin Cities Car Service is proud to present our new app, designed to make your bookings even easier while you are on the go. Our free app is available for download for your Android and iPhone smartphones. Packed with quality features to make planning and booking of your next ride more simple than ever before. The Twin Cities Car Service app lets you place your reservations quickly and effortlessly. The user-friendly and intuitive design provides you precise and relevant information for your next reservation. Our free app offers the most transparent reservation platform with no hidden costs or fees. Our app offers the easiest way to make your reservations. It undoubtedly provides all the control you need, without any surprises. Manage your transportation with a click of a button. We are committed to making your experience an enjoyable one from start to finish.